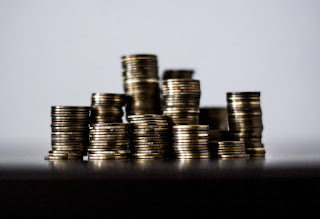 Well August was a bit of a let down compared to the fun of July, our big family trip to the Cayman Islands; however, my investments and dividends didn't let me down. My FI Portfolio produced $300.34 in dividends during the month while my FolioFirst portfolio added another $1.84. My Roth IRA was a big, fat goose egg but that's been the norm for the middle month of each quarter. Across all accounts I received a total of $302.18 during August. As I mentioned above my FI Portfolio produced $300.34 in dividends last month. Compared to May that's a solid 4.2% increase which was fueled by dividend growth and reinvestment alone. However, compared to August of last year the increase only came in at 6.3%. Given that discrepancy I can see that the difference was due to YUM Brands (YUM) paying a dividend last August, but not this August. They've changed their payout schedule over that time which is throwing off the year over year comparison. Adjusting for that to give a more accurate representation shows that the year over year increase climbed to 11.3%. That's what I'm talking about! Especially since that doesn't account for new capital being deployed. My Roth IRA was a no-show, as per usual, during August. The pay raises just keep on coming. 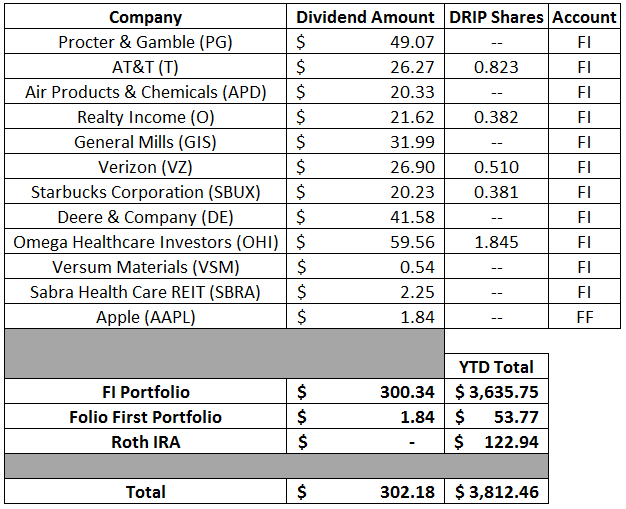 August saw another 5 dividends being raised up among my FI Portfolio positions. You mean a company I own a piece of, albeit tiny, wants to pay out more of their profits to me just because I own part of the company? Sign me up! Combined those 5 companies boosted my forward 12-month dividends by $46.79. Through the end of August I've had 43 announced raises from 39 of the companies that I own combining to increase my forward 12-month dividends by $390.35. What's really amazing is that organic dividend growth this year has already surpassed 2017's total of $267.57 by nearly 50%. My forward 12-month dividends for my FI Portfolio ended August at $6,452.56 while my FolioFirst forward dividends are at $91.05. That brings the total taxable account forward 12-month dividends to $6,543.61 My Roth IRA's forward-12 month dividends increased to $371.75. Across all 3 accounts, assuming no dividend cuts or position size changes, I can expect to receive at least $6,915.36 in dividends over the next year. The rolling 12-month monthly average for my FI Portfolio is at $496.85 per month which is a decent $23 above 2017's monthly average of $473.37. I'm inching my way to $500 per month!